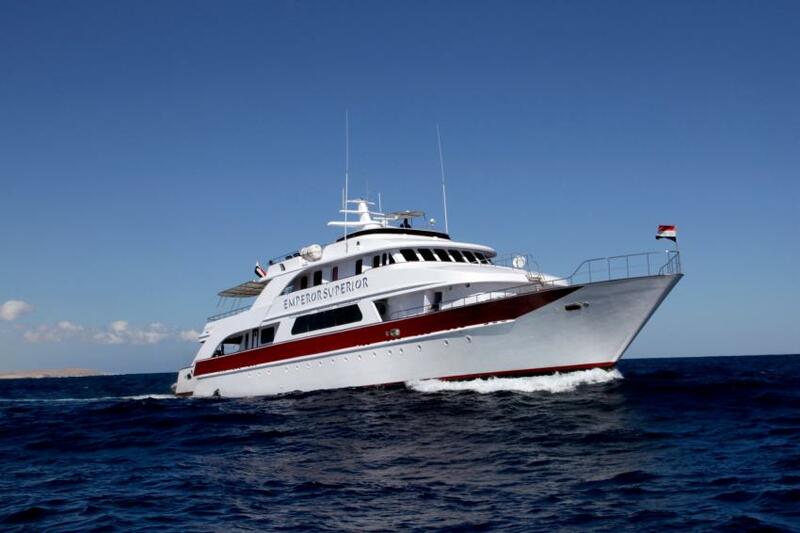 One of the Emperor Fleets Boat Emperor Superior runs diving safari on the Red Sea. Almost all types of accommodation are possible on Emperor Superior. There is a double cabin placed on an upper deck, equipped with shower and air-conditioning. Еtwin cabins are mainly on the lower deck, they have the samе facilities. There are also 2 bunk bed staterooms on the same deck. The comfortable salon area is perfect to spend time in the evening or just relax after dive. Plus, there is a TV and DVD in the lounge area of the boat. Sun deck of Emperor Superior has a shaded part and numerous of sun loungers. Dive deck of Emperor Superior is big, has enough of space for each diver and comfortable to prepare for the dive. There are a lot of storage boxes for the gear. The boat can provide Nitrox for divers with EANx certification. Dive deck of Emperor Superior also has a dive platform. Safety on the board of Emperor Superior meets all international standards. Boat equipped with fire alarm, life vests, and emergency raft, also with first aid kit and medical Oxygen. Famous Five is one of the itineraries that Emperor Superior offers. This route includes diving on a fascinating wreck of Red Sea: Rosalie Moller, Abu Nuhas, Thistlegorm, Ras Mohamed, Brother Islands, Salem Express. Diving on Thistelgorm is a must for the safari in Red Ses. Seein sunken ship with motorcycles and trucks on the board is an unforgettable experience. Another memorable dive can be on the Abu Nuhas ship cemetery. Not many boats can offer to explore the Rosalie Moller. Round this wreck diver can see much pelagic fish. Emperor Superior itineraries consist of the most amazing dive sites, that divers can not find in other places. First of all its famous wrecks of Red See. Also, its Marin Parks with colorful reefs, pinnacles, underwater mountains. The Red Sea is full of different fish. During the diving, several types of sharks can be spotted, like hammerheads. Jackson Reef and Straits of Tiran are the most recognized dive spots that can be visited during the safari on Emperor Superior. Diving in Egypt is possible through the year. The best time to visit its dive spots is Autumn when water temperature is not too high like in the summer months. Winter, also, can be a good time for diving in Egypt.